Mainconsole stop recording in a couple of days or it just stop to recording. 1. Your CUP loading is over 80%. 2. You might using non-supported Hard Drive model or Green HD. 3. The recording throughput is over 80Mbps and user didn't enable the Disk load balance function. If the throughput is very high, the HDD may not be able to handle that much data on time and cause the recording stop or miss, even the CPU loading is low. 4. The Automatic Recycle mechanism is less than 10%. For example, the Recycle mechanism is 5% as below picture. 5. The virtual memory is too high. If the virtual memory reached to 1.7GB or 3.7GB (depends on the OS), it will first stop the recording and cut all remote access and it will restart the Mainconsole once reached to 1.8GB / 3.8GB. If the virtual memory is overrun, it will generate a file called “VirtualSize.txt”. If your CPU is not efficient enough, please upgrade your CPU. Or you have to reduce your recording performance such as resolution and frame rate. 2. Please check your Hard Drive model, please do not use green HD. 3. Please enable the Disk load balance function. 4. Please adjust the recycle mechanism at least to 10% to ensure not to make the HDD too full. 5. Regarding the virtual memory overrun, please visit at below link: http://www.nuuo.com/WikiDetail.php?sid=0008&product=0002 to solve this issue. 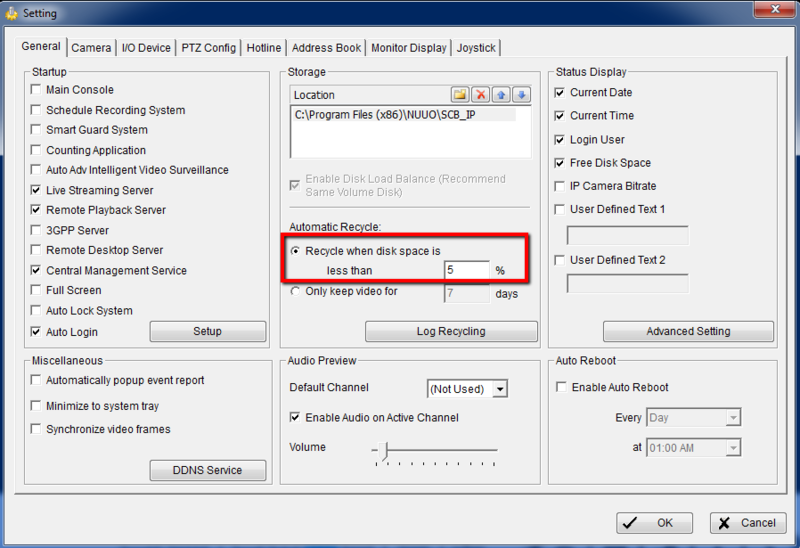 [Mainconsole][6.0] How to take backup of the configuration?